So my friend Karrey says that she doesn't like reading long blocks of text and that I should break it up with a picture. Thus, I will force myself to include a picture at some point in today's hot-poop update. Even if I don't want to. Because that's what you, the reader, demand. At least, one of you demanded it. And so I shall provide. I have to do my radio show tonight. Today on ebay a seven-inch that I have sold for $40. 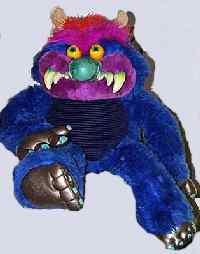 My roommate Mariah got one of those "My Pet Monster" dolls and it's in the living room. It sits on a speaker and when I leave to go urinate in the middle of the night I can see its eyes from across the room and it is very disconcerting. So we got our first bunch of student pieces to be workshopped today. I'm starting to get really nervous in this class, but not for the reason I was really nervous before. I'm afraid that I won't be able to criticize these pieces in class for fear of incurring the wrath of others. There's some really bad stuff. What can I say about that and not hurt the writer's feelings? 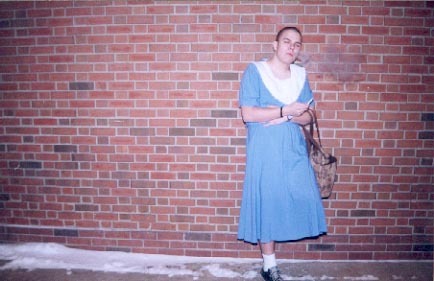 And now, here's a picture of my friend Bill wearing a dress. Okay. I work all day tomorrow in the comic shop. I guess I'll rap at ya some more after that.